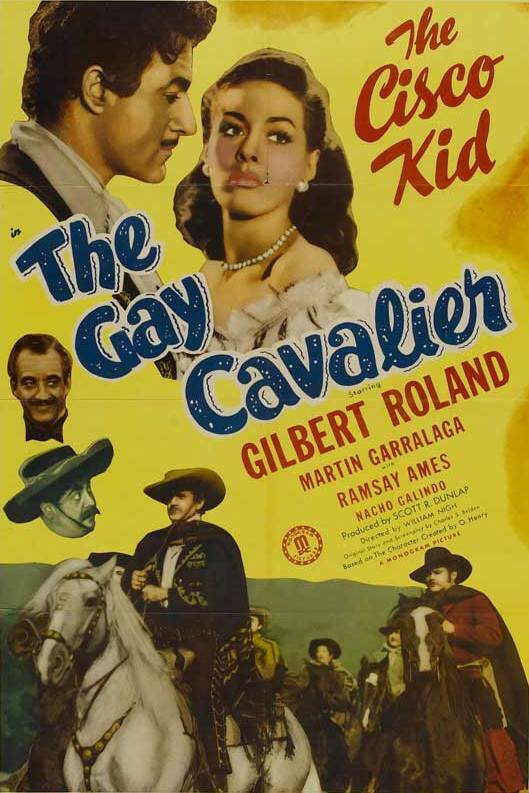 With this film, handsome 40-year-old actor Gilbert Roland stepped into the role of the Cisco Kid, a Mexican bandit created by O. Henry in his 1907 short story “The Caballero’s Way.” Roland was the fifth man to play the role, after Warner Baxter (in four films, 1928-1939), Cesar Romero (in five films, 1939-1941), Duncan Renaldo (in three films made in 1945), and William R. Dunn, who was the first man to play the Cisco Kid, in the silent short The Caballero’s Way (1914). Roland would go on to play the Cisco Kid in a total of six films released by Monogram Pictures in 1946 and 1947. In O. Henry’s short story, the Cisco Kid was a vicious and slippery bandit, but by the time Warner Baxter was playing the role, the character had metamorphosed into a noble caballero; a sort of Mexican Robin Hood. Baby boomers will remember that on TV, the Cisco Kid had a sidekick named Pancho. The first iteration of this character appeared in the 1939 film Return of the Cisco Kid, and he was named “Gordito” (Spanish for “Fatty”). In The Gay Cavalier he’s called “Baby,” and is played by the Mexican actor Nacho Galindo. Baby gets the first lines of the picture. While Cisco kneels beside a grave, Baby explains to one of his fellow outlaws (presumably one who has just joined the gang and, like the audience, has no idea what’s going on) that Cisco’s father was a notorious bandit. To make up for his father’s exploits, Cisco now robs from the rich and gives to the poor. It’s a clumsy bit of exposition, but no clumsier than most of the rest of the dialogue in the picture. When Baby decides that they’ve spent enough time at the gravesite and he wants to get going, Cisco tells him, “Time is a wonderful thing. It ages wine and mellows women.” Roland is the main reason to see the picture, especially for women who get all hot and bothered for the Latin Lover type. He can really sell lines like this, and not sound too ridiculous. What Roland is mostly selling, of course, is S-E-X. But not so much that it might offend audiences, or disrupt traditional morality too much. In one scene, Cisco climbs up onto a lovely young señora’s balcony while Baby plays a little music down below. Eventually she reveals that she has a husband who is away on a fishing trip. Cisco responds, “Sometime, when I see your husband, I will tell him the fishing is much better here on land. Adios, beautiful.” He kisses her hand, leaps from the balcony onto his horse, and rides off with his crew and Baby, whose serenade is no longer required. The Gay Cavalier takes place in California in 1850. The nice thing about old Hollywood westerns that take place in California is that the scenery is authentic, if nothing else. Martin Garralaga, the actor who played “Pancho” in the three 1945 Cisco Kid films with Duncan Renaldo, here plays Don Felipe Geralda, a man who has fallen on hard times. His youngest daughter, Angela (Helen Gerald), is engaged to marry a wealthy American named Lawton (Tristram Coffin), whose money will allow the Geralda hacienda to stay in the family. All of this plays out about as predictably as you’d expect. The enjoyment comes from the particulars. The sultry and beautiful actress Ramsay Ames plays Don Geralda’s eldest daughter, Pepita, and she sings a few numbers that Ames herself is credited with writing. Also, the action is well staged, especially the final showdown between Cisco and Lawton. As he demonstrated in a film I watched last year, Captain Kidd (1945), Roland is a hell of a sword fighter. He and Coffin go at it with no stunt doubles in evidence, although the film is sped up very slightly. Also, unlike most of the actors who played the Cisco Kidd, Roland was actually Mexican. He was born “Luis Antonio Dámaso de Alonso” in Juarez, Chihuahua, Mexico, in 1905. He took his stage name from his two favorite actors, John Gilbert and Ruth Roland. He’s a very credible swashbuckler, and a lot of fun to watch, even though The Gay Cavalier is strictly a programmer. One odd note, the DVD from VCI Entertainment I watched uses a print with a strange ADR issue. It didn’t take long before I noticed that every time someone said “Cisco Kid” it was looped in, and not well. I did some research, but couldn’t find exactly why this was the case. This was originally released as a Cisco Kid feature, and there would have been no restriction on using the name, so the prevailing theory seems to be that the film was dubbed for television release in the ’50s, and the character’s name was changed so as not to cause confusion with the Cisco Kid TV show, and one of those prints was the only one they could find, so they dubbed the original character’s name back in. Whatever the reason, it was weird and distracting. Posted in 1946, March 1946 and tagged Charles Belden, Charles J. Bigelow, Edward J. Kay, Frank LaRue, Fred Maguire, Gil Frye, Gilbert Roland, Harry Neumann, Helen Gerald, Iris Flores, John Merton, Martin Garralaga, Monogram Pictures, Nacho Galindo, O. Henry, Ramsay Ames, Scott R. Dunlap, Sidney Sutherland, The Cisco Kid, The Gay Cavalier, Tristram Coffin, Westerns, William Nigh. Bookmark the permalink.